Portsmouth, New Hampshire, on the Piscataqua River, is a town of a million historic house museums. Okay, maybe that’s an exaggeration. Maybe. In the 18th century, it was a prosperous shipping community with an abundance of extravagant houses built by wealthy merchants. Many of those houses are now museums. I’d been in Portsmouth in May and had learned a valuable History Tourist lesson: many small museums in New England do not open until June. So I went back in October, just before they all closed for the season, to see what I’d missed. I was cutting it close, but you know History Tourists: we like to live dangerously. We saw six historic houses in two days during this go-around. They’re all of similar age (18th century) and style (Federal/Georgian), so I’m not going to do a separate post for each. But I’ll cover them all and try to point out what was unique. The Wentworth-Gardner house was built in 1760 as a wedding gift from Mark (is it just me, or does Mark seem like a very unColonial name?) and Elizabeth Wentworth for their son, Thomas. The Wentworths were the family in colonial New Hampshire. In 1915, Wentworth-Gardner (the Gardners owned the house through the 19th century) was bought by photographer Wallace Nutting. I’d never heard of him but he’s apparently well-known in New England preservation circles — it’s thanks to him that many of the houses survive. He collected colonial houses, restored them (in a very Colonial Revival way), then photographed people in colonial costumes in them. All the houses have beautiful woodwork because there were lots of shipwrights in the area who worked on houses during the ship-building off-season. Wentworth-Gardner is next door to, and owned by the same association as, the Tobias Lear House. 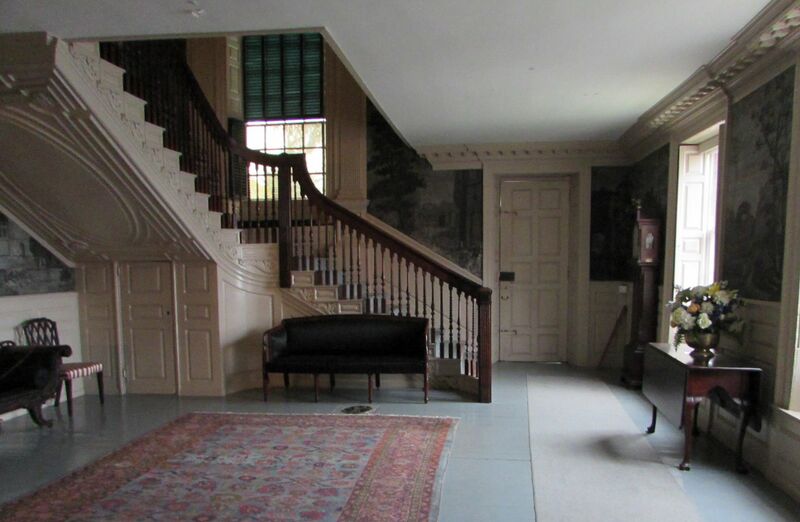 Tobias Lear was secretary to George Washington and when GW made his New England tour in 1789, he paid his respects to Tobias’ mother at the Lear house. So of course, I wanted to see it desperately to stock my “stalking George Washington” portfolio. So of course, the Lear House was closed because of a burst pipe. 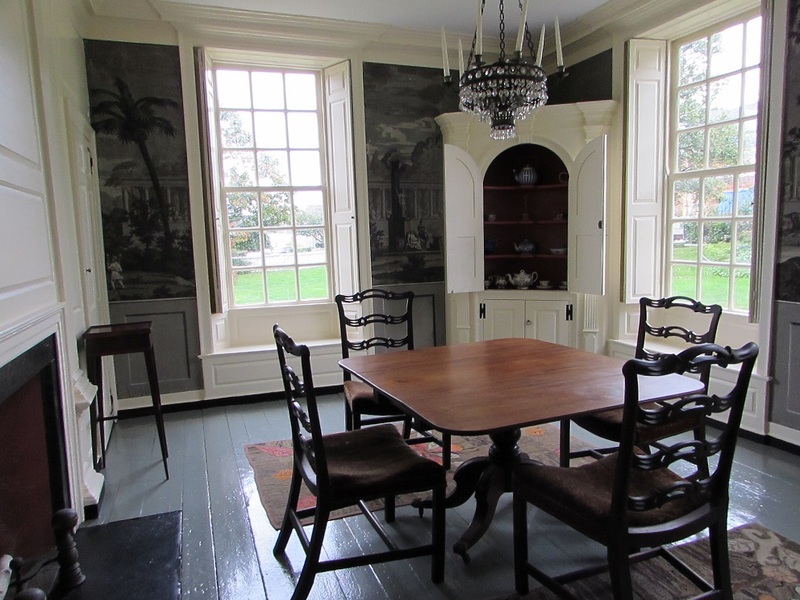 If I had to choose only one house to tour in Portsmouth, it would be a toss up between Moffit Ladd and the Warner House (that I’d written about last summer). As you can see by this photo of the entryway, Moffit Ladd is stunning. And it was huge — the rooms just went on and on. 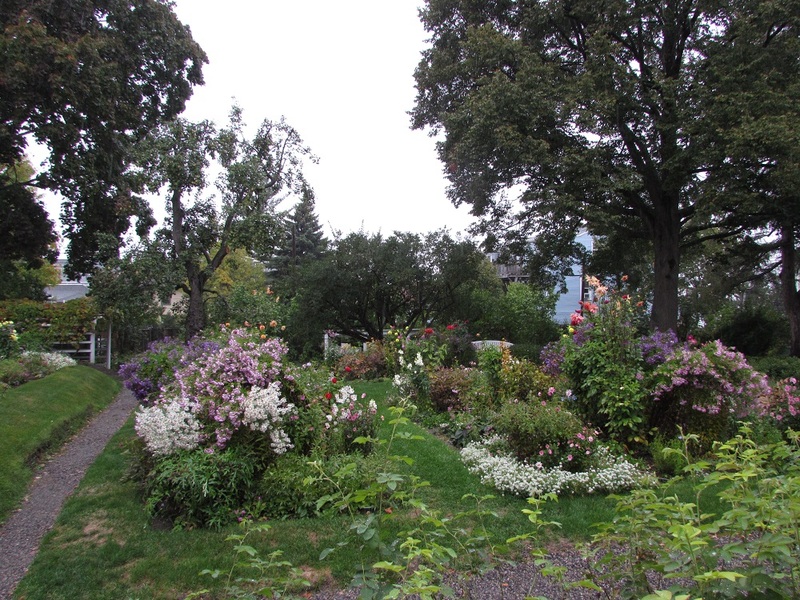 And their gardens, even in October, were also quite amazing. Moffatt-Ladd was completed in 1763, as a wedding gift from John Moffat to his son, Samuel. Houses for wedding gifts must have been the thing in 18th century Portsmouth. A combination of being a spendthrift, unlucky in business and having an underhanded brother-in-law (who claimed he’d given Sam a loan rather than entered into a partnership with Sam, when a joint business deal went under) ended with Sam fleeing to the Dutch West Indies. His wife Sarah followed, taking their oldest child but leaving behind two others, who were raised by Sam’s sister Katherine. Years later, those same children would side with their run-away mother over Katherine in a property dispute. Katherine seems to have been the general dogsbody of the family. Along with her niece and nephew, she also cared for her aging parents. John knew that his son wasn’t a particularly good businessman, so had never turned over official ownership of the house to him. That saved it from Sam’s creditors. After John’s wife died, John and his daughter Katherine moved into the house. About a year later, Katherine married her cousin William Whipple and had what seemed to be a very happy marriage. The tour took us up to the third floor and the servants/children’s wing. 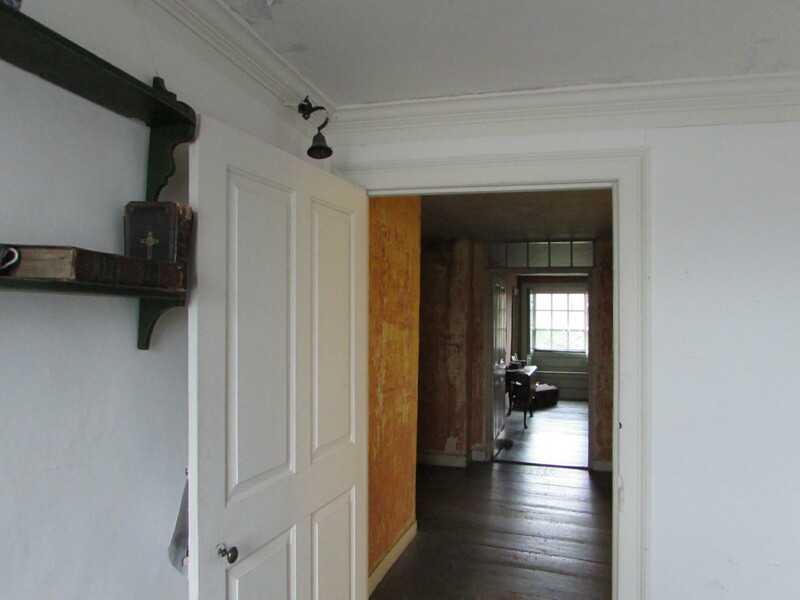 Above is a view from the bedroom of William Whipple’s enslaved manservant Prince, across the hall into the nursery. Prince Whipple became famous when, along with 19 others, he petitioned the New Hampshire legislature for freedom. He was literate and wise in the ways of freedom and revolution, having accompanied William, a representative to the Continental Congress, to Philadelphia. Their petition was denied but William eventually freed him anyway. The Ladds were descendants of the Moffats and owned the house from 1818 to 1911. They’re the ones who added the wallpaper in the great hall. Kathie called all the houses we planned to visit, to see whether I could take photos inside. Wentworth-Gardner and Moffit Ladd said yes on the phone, but then said no when we got there. They both changed their minds again when we challenged them, but Moffit-Ladd had me sign a waiver saying I wouldn’t use the photos for any commercial purpose. No prob. 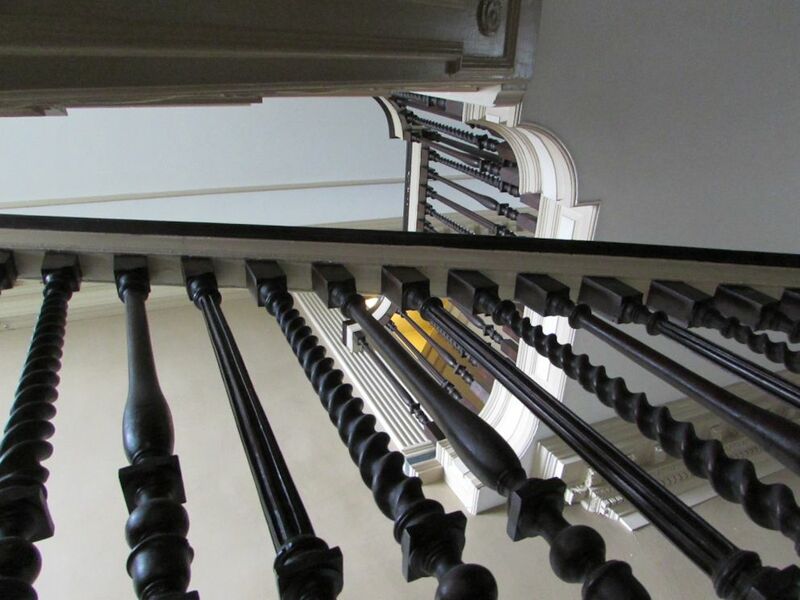 Gallery | This entry was posted in New Hampshire and tagged Moffit Ladd House, Wentworth-Gardner House. Bookmark the permalink. Beautiful homes – and just a few hours away. I must get down to Portsmouth sometime. Good for you – sticking to your guns and getting the inside photos for the rest of us! I’m also glad to hear that dogsbody Katherine prevailed in the end. Portsmouth is in the top five of my all-time favorite towns — such a beautiful, charming, historic place. I’d try to convince Grant to retire there, if the New Hampshire winters weren’t so brutal. They’re not so bad…on the coast at least. Besides, once you embrace them they always seem too short. It’s mud season in April that’s no fun. Not so bad. Is that an example of New England understatement? Ha ha. I’ve always liked the snow and looked forward to it, maybe because it meant you might have a snow day and get to play outside. Still do, although playing involves different activities now. It is that. And most of them are right mid-town, all within walking distance of each other. Portsmouth is known for being a very walkable town. It was only about 30 years ago it was ‘discovered’ and people started buying up and restoring all the older homes after many years of neglect. That’s what I love about it — that it’s walkable. Everything I’d want is right there.